In a shocking big brother move by the American Chiropractic Association (ACA) they have engaged the Food and Drug Administration, state radiation programs, the Conference of Radiation Control Program Directors (CRCPD), the American Chiropractic College of Radiology, the American College of Radiology, the American Association of Physicists in Medicine, and the Medical Imaging Technology Alliance to gather radiation output and utilization data from chiropractic clinics. 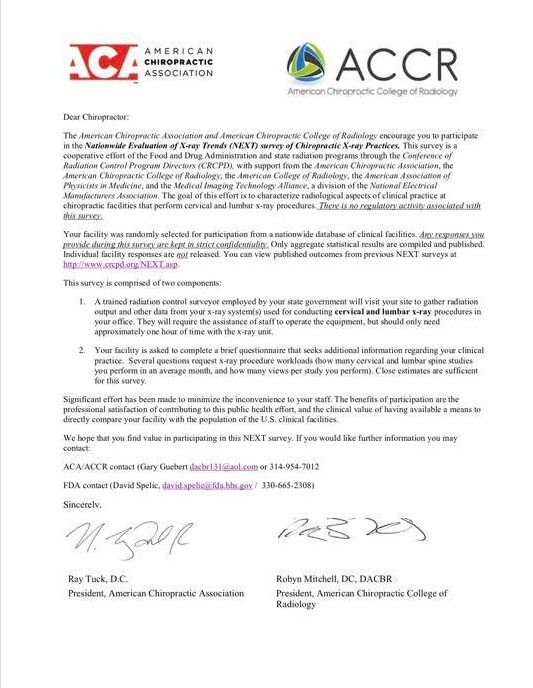 In a letter being sent to randomly selected chiropractors chosen from a "nationwide database of clinical facilities" the President of the ACA Ray Tuck and the President of the American Chiropractic College of Radiology Robyn Mitchell state this is a "public health effort". Besides these chiropractic trade organizations, major insurance companies have recently adopted these restrictive guidelines and the rights of chiropractors to take x-rays have been taken away in places like Ireland. 1. A trained radiation control surveyor employed by your state government will visit your site to gather radiation output and other data from your x-ray system(s) used for conducting cervical and lumbar x-ray procedures in your offcie. They will require the assistance of staff to operate the equipment, but should only need approximately one hour of time with the x-ray unit. 2. Your facility is asked to complete a brief questionnaire that seeks additional information regarding your clinical practice. Several questions request x-ray procedure workloads (how many cervical and lumbar spine studies you perform in an average month, and how many views per study you perform). Close estimates are sufficient for this survey. "Any responses you provide during this survey are kept in strict confidentiality. Only aggregate statistical results are compiled and published." This unprecedented move on the part of the ACA to peer into chiropractic practices comes at a time when chiropractors who manage vertebral subluxation in a salutogenic model are being targeted for "elimination" by various trade groups, regulatory authorities and leadership at chiropractic colleges around the world. Chiropractors are urged to carefully consider participating in any way with this effort by the ACA to use the government and radiation control authorities to find out what you are doing in your office.